Why you are an SEO Champion. Many business owners spend considerable time trying to get their sites to the top of the search engine rankings. Their initiatives often fail and it can seem like an impossible task for a small business owner. You can of course if you have the budget opt for a couple of different tactics to get your business noticed. 2. Employ an SEO professional to do the work for you and make sure your site is set up correctly. If your business has the budget both of these are effective and often successful strategies. 2. Generate good unique content. You know your business, you know those little tricks and tips that are invaluable to people who are not in the know. This is what they are most likely searching for on Google. You probably give this advise all the time when you are with friends and customers. So, why not write it down and publish it on your website. Yes there is a skill in learning how to write the article, but if your web designer has built your site for you on Word Press (yes its not just for blogs), great, you can add pages to your blog , set up a category in your specialist areas and write posts on the areas of the business you know. Do this over a period of time and you are in effect generating good quality unique content for your website. 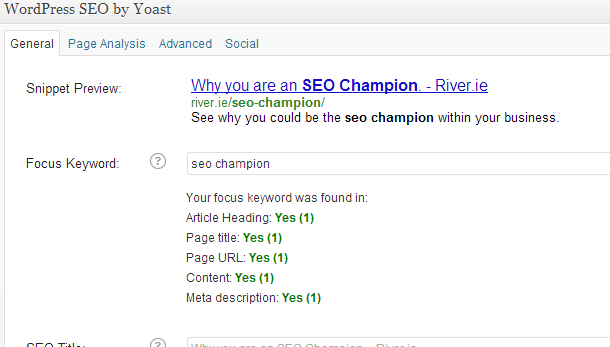 If you have your site built on Word Press you can install (or get your web designer to do it) SEO tools such as Yoast. Which will help you write your posts and pages in an efficient and SEO friendly manner.